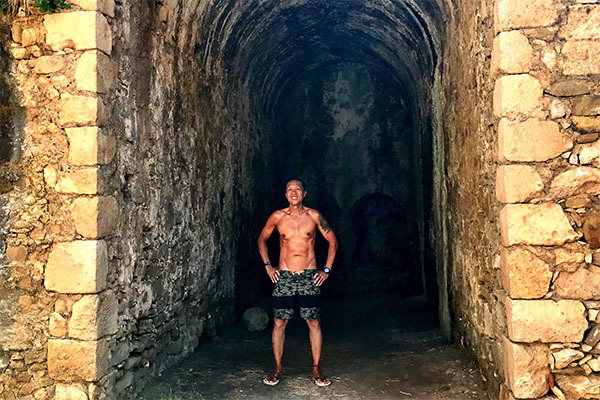 The best modern day discovery in Greece is the lazy and idyllic seaside town of Methoni where tourism has not spoiled this wonderland. Methoni Greece is the mythical and enchanting coastal town in Western Messinia of the Peloponnese peninsula. Ancient Greece was a civilization belonging to a period between 12th-9th centuries BC to the end of 600 AD. 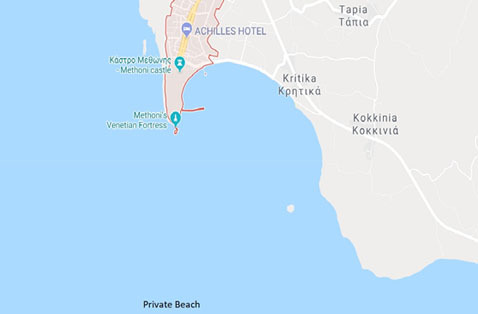 Methoni has been identified as the city of Pedasus, which Homer has written in the Odyssey under the name “Ampeloessa” (of vine leaves), where the Greek King Agamemnon offers Achilles a place to rest so that he can make peace with himself. 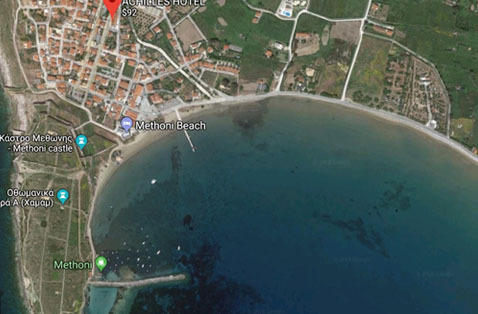 And one of the reasons why Methoni has survived from the Byzantine era to this modern day Greek resort is because of the “Oinoussai” complex of islands, (Sapientza, Schiza and Santa Marina islands), that protects the port of Methoni from Caribbean storms. 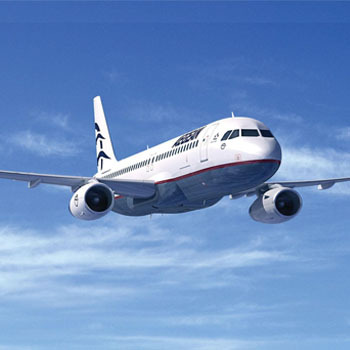 These Greek islands buffers and hinders most of the sea storms and large waves that can deteriorate any beach. That is why you can walk out many meters in knee deep water where elderly and children can have fun and play together. 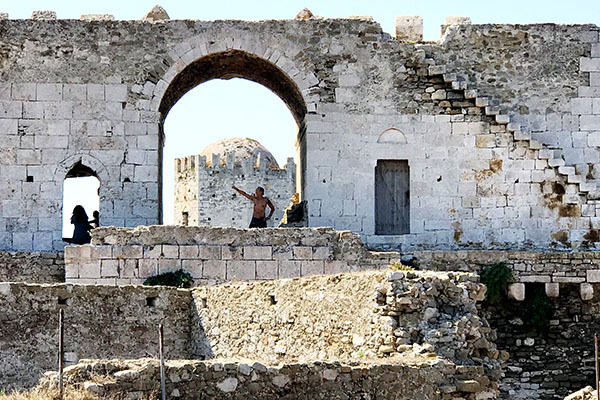 In Methoni, aside from the wonderful calm beach, there are many ways to relive the ancient Greek civilization. Visiting the Methoni castle fortress that was built in a strategic position for trade and defense on a rocky promontory, this Greek castle ranks among one of the largest in the Mediterranean with 14 stone arches, imposing gates, emblems, inscriptions, fortified islet floats called the “Bourtzi,” a Byzantine church, and the Turkish baths. Built by the Venetians in the 13th century, it was rebuilt by the Turks during the 16th century. Walk around the nearby quaint streets that are lined with fragrant flowers and blossoming fruit trees like fig, lemon, and pomegranate, you will see the beautiful low stone houses that are truly picturesque. And dotted all around Methoni are inexpensive taverns, bakeries, restaurants, cafes, gift stores, and hotels. 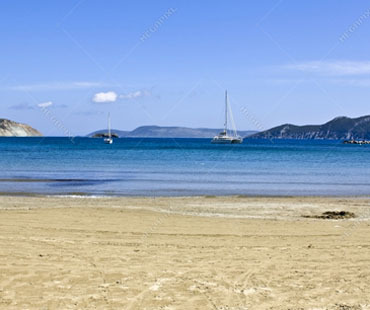 Everything is just a 10 minute walk from the beach to the castle to a bakery so a car is not necessary unless you plan on visiting the other towns like Pylos and Finikounda which are only 15 minutes away by car. 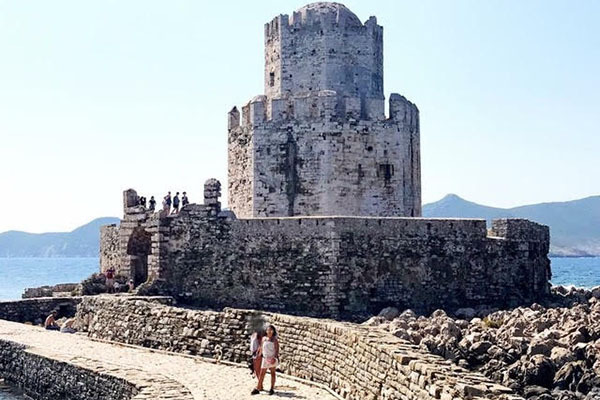 The Methoni Castle: Built in the 13th century by the Venetians, the Methoni Castle is a strategic fortress and one of the largest well preserved castles in the Mediterranean. For a very nominal entrance fee, (€2), one can easily spend several hours tracing and reliving the ancient wonders of a fortress community. 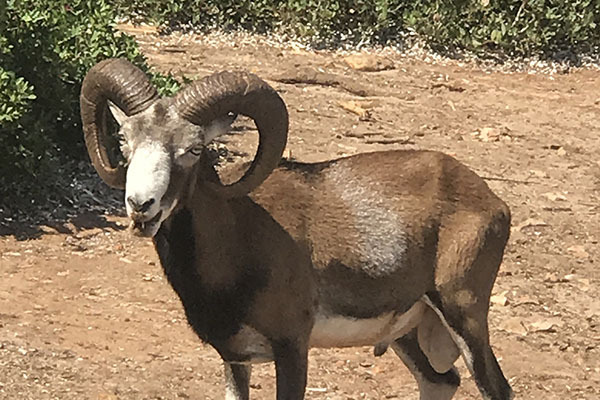 Go by boat across the Methoni Bay to a private beach where you can swim or snorkel in the warm shallow waters and also see an ancient arbutus forest, wild sheep and goats (Kri-Kri), pheasants, and many other birds and animals in their natural untamed habitat. 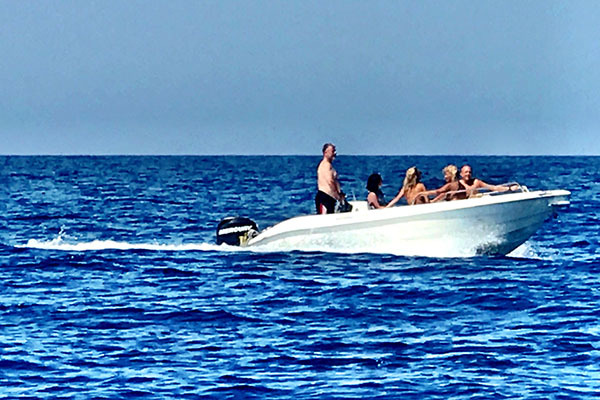 Ride in a speedboat with Captain Fotios to see the surrounding Methoni Bay as well the Methoni Castle but from the point of view of the sea. Relive what the powerful medieval Venetian Navy saw when they arrived in the 13th century. 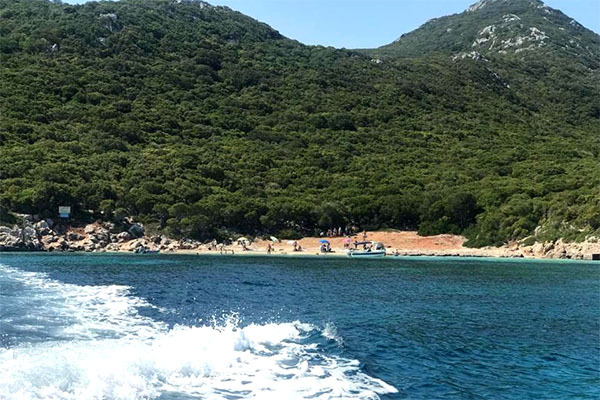 €25 Per Person Take a trawler boat with other vacationers to a private beach. 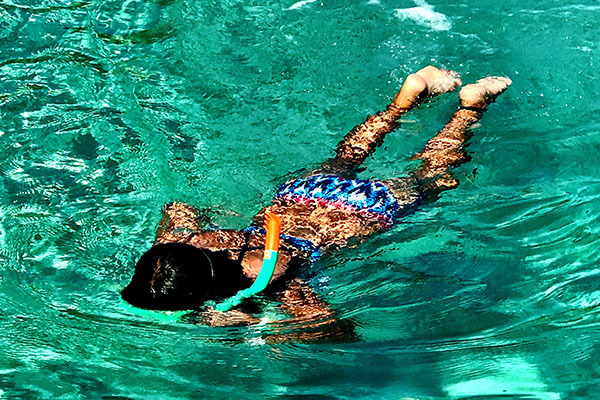 Make new friends, practice your Greek, swim and snorkel in the warm waters, Children must be accompanied by an adult. 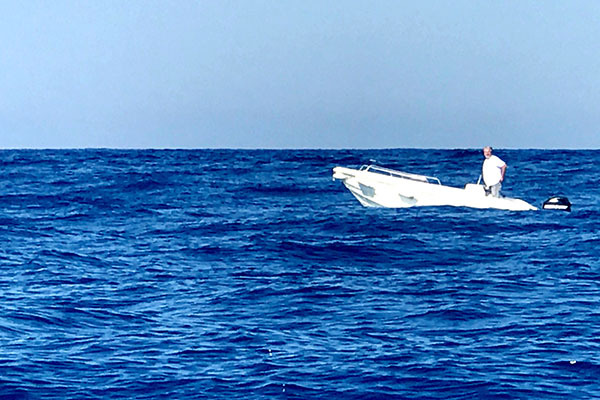 Return trip from Methoni Bay several times a day. 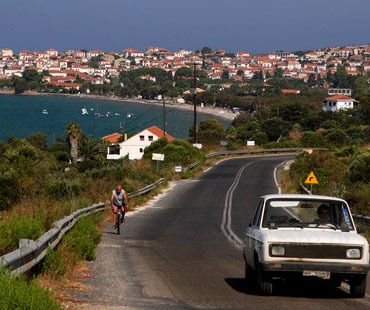 Spend the day at neighbouring coastal towns of Pylos and/or Finikounda. 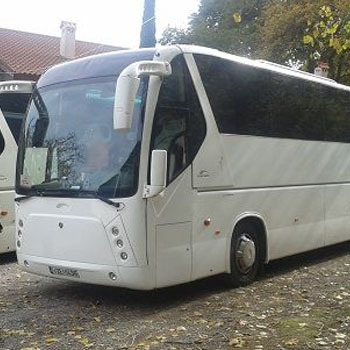 We will drive you there and back, take you on a welcome tour of all the nice restaurants and stores, and give you sun umbrellas for the beach. Cash is more commonly asked for instead of credit or debit cards and some places only take cash. Plus one can strike a better deal or have more bargaining power with cash. Carry an unlocked cellphone, buy a “COSMOTE” SIM card at any cell phone store for €5 and add a €10 top-up for 6 GB of data with unlimited calls and text. 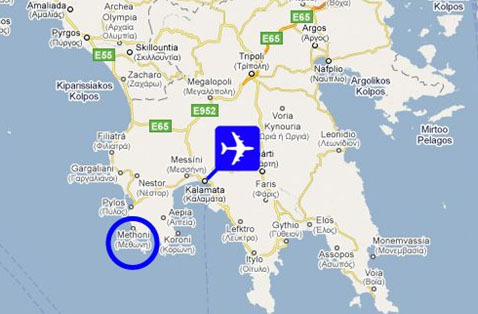 So for €15, you have unlimited use with a huge 6GB of data which you can use all over Greece especially on Greek ferry boats and any Greek island, (Noted is that the plan from COSMOTE in 2017 was called “Whatsup.”) This is a must because roaming is not efficient in the Aegean sea as well as in the mountains. Most places have free WiFi. Travel with mosquito spray if you don’t like to be bitten especially when you are sitting on a table like in a restaurant because mosquitos tend to lurk underneath the table. That is why you don’t really see them but can get bites. 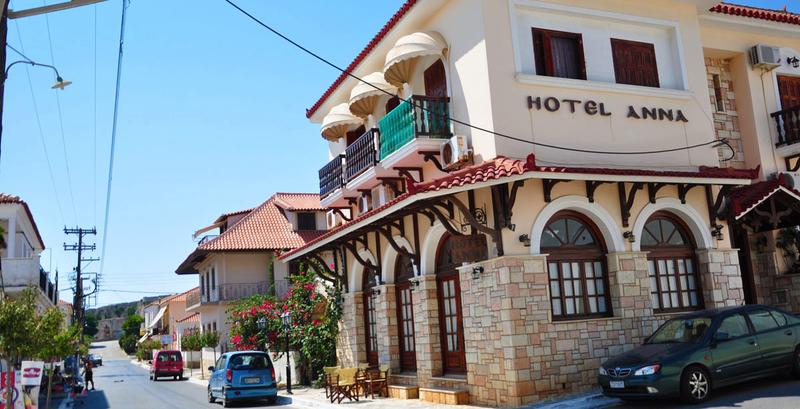 The traditionally built Hotel Anna is located in the Methoni Village, just 150 metres to the sandy beach and nestled in tavernas, bakeries, and souvenir shops. It offers air-conditioned accommodation with free Wi-Fi and a private balcony. Newly renovated in 2018, the large rooms also have a refrigerator, TV, a safety deposit box, a telephone, and a private bathroom with shower. Continental breakfast is served daily and free public parking is located nearby the hotel. Hotel Anna is just a few minutes to the Venetian Castle of Methoni, 11 km from scenic town of Pylos, 10 km to the seaside village of Foinikounta, and 62 km to the Kalamata International Airport. 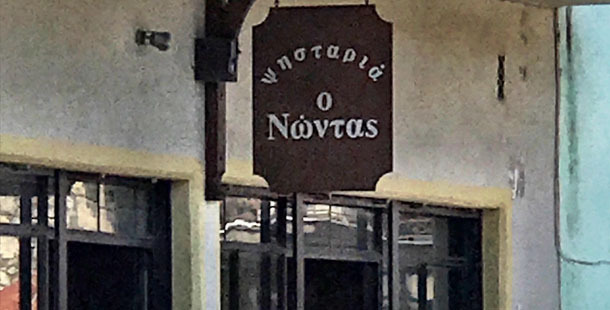 Methoni has many Greek Tavernas that make authentic dishes like Moussaka, Pastitsio, and Dolmades from home grown vegetables, herbs, and meats as well as fresh catch-of-the-day seafood such as delicious sardines, Barbouni, and tender grilled octopus. Plus savour the delicious ripe figs, black grapes, aromatic cantaloupes, and juicy peaches that are harvested daily. 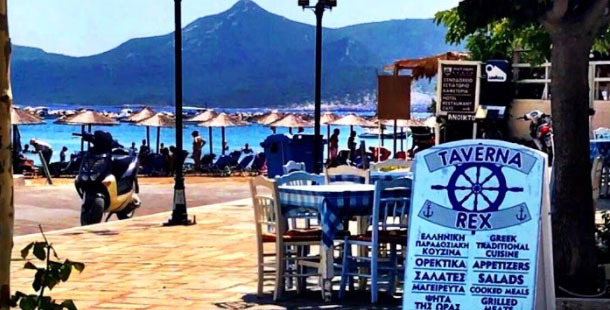 Located a few feet from the beach, this taverna has by far the best food in the “public square” area. Preparation is authentic and by hand, fish is caught daily, and produce is from the family farms. This hidden grill in the heart of Methoni serves the best souvlaki in the area. Very traditional and homely, you can eat and drink on the outside terrace. 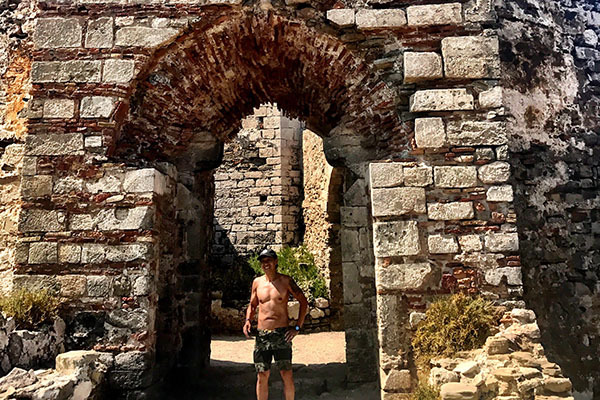 Captain Fotios grew up here and watched Methoni transformed from a small town and into a vacation paradise. This coastal town never lost its charm or got ruined as a tourist trap. He always says that this is one of the few areas where there are a lot of trees and vegetation as other towns and islands are very dry without a lot of green even though the weather is the same. 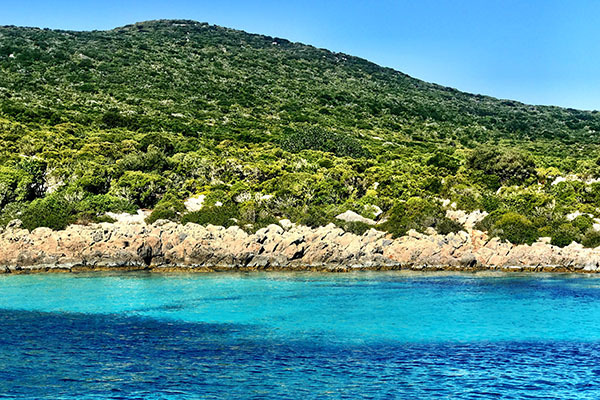 Islands like Mykonos and Santorini are more mountainous, arid, and dry while Methoni is vibrant and fertile. Forest are abundant here while grapes, figs, lemons, cantaloupes, etc., grow everywhere as far as the eyes can see. 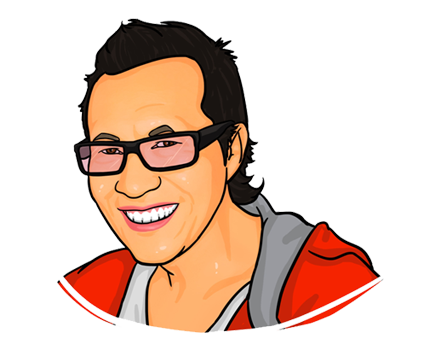 Wallace is an international traveller who is always in search for the perfect vacation spot. 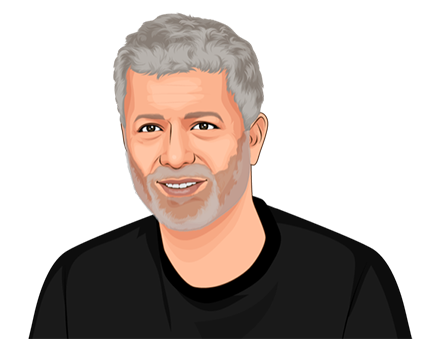 He has travelled the world, contributes to travel blogs, and also develops travel accessories.